Onward and upward. One more loaf before I head out in the morning, then I will bake a couple when I get to my mom’s. This one is touted by the author as “the ultimate breakfast bread.” From the ingredients, it sure sounds like that will be an apt description. Ingredients for this loaf go into my bread machine in the following order: 1 1/8 cups buttermilk, 2 tablespoons walnut oil, 1 1/4 teaspoons salt, 3 cups bread flour, 3 tablespoons light brown sugar, 1 tablespoon cinnamon (yeah, a whole tablespoon,) 1 tablespoon gluten and 2 teaspoons SAF yeast. I have set the machine for a medium crust and the basic bread cycle. While that gets going, I chop up 1/2 cup dried apples and 1/3 cup pecans. They will be added when the machine signals between Kneads 1 and 2. As I check the dough after the first mix, it seems really dry. I will add more buttermilk, a little at a time, until the consistency looks right. I am concerned that the first knead won’t be enough to blend the buttermilk in completely. Please don’t let me end my night with another brick. It was looking really ugly, so before adding the apples and pecans, I tossed the dough and started over. This time, I added 1 more tablespoon of buttermilk during the mixing phase and it already looks better. 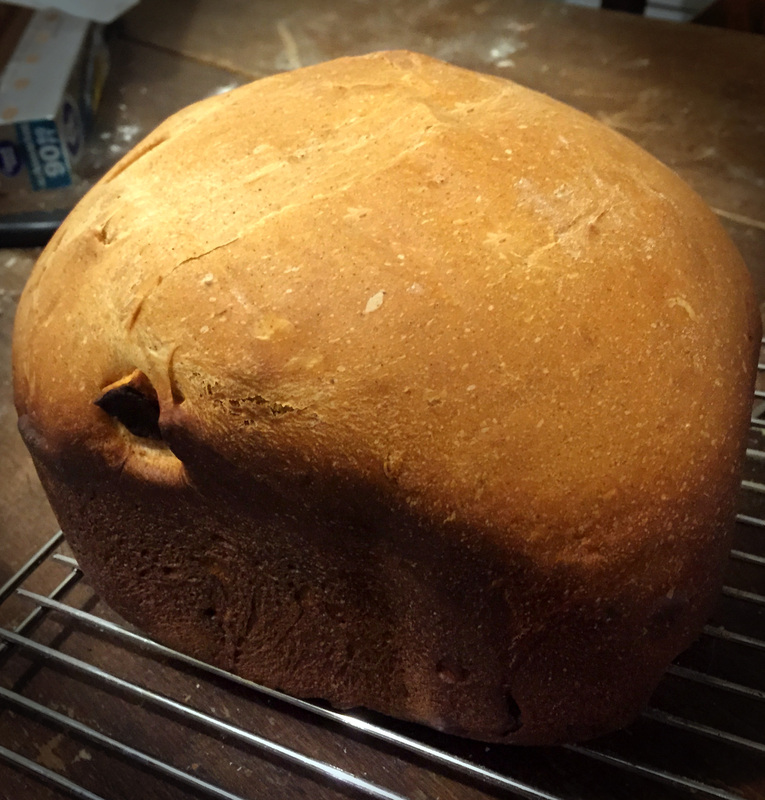 This loaf didn’t rise terribly high, but that is what I am expecting from the sweeter loaves anymore. Still it looks significantly better than the Greek Currant Bread I did earlier today. It smells really lovely, too. The scent of apples and cinnamon is always a delight.